Vegetable fry masala - A delectable dish of rich, mildly spiced gravy, faithful to the original, traditional Vegetable masala recipe. Just add long-grained Basmati rice and garden-fresh vegetables and cook! Cook vegetables of your choice. Heat oil, splutter mustard seeds, fry chopped onions until golden brown, add tomatoes, curry leaves and stir fry for 2 minutes. 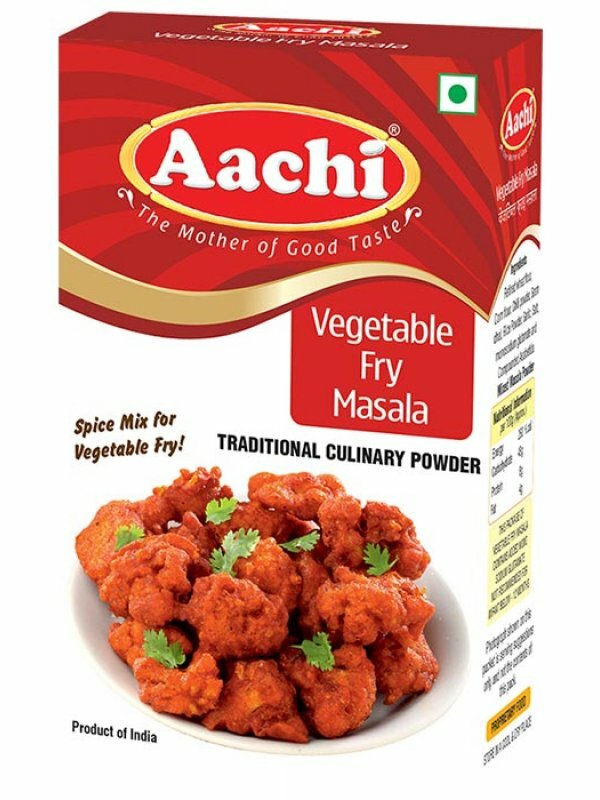 Add Aachi Vegetable masala and blend well. Now add pre- cooked vegetables and sufficient water and allow it to boil. Add coconut milk. Cook till the gravy thickens. Tasty Aachi vegetable gravy is ready -to- serve. Coriander, Chilli, Cumin, Black Pepper, Cardamom, Salt, Cinnamom, Bay Leaves, Cloves, Nutmeg, Turmeric and Aniseed.